From our Cake Topper Collection: Perfectly beautiful crown jewels cake crown. The enamel amber flowers are accented with green leaves, dragonflies and butterflies. All are set off by jewels and rhinestones all flowering around the silver plate crown. 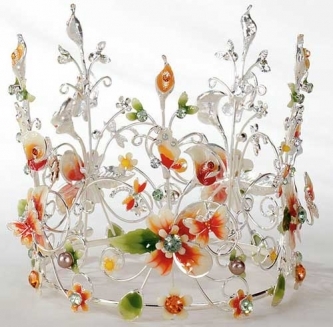 The Amber Jeweled cake topper crown is 4 1/2" tall and 5" in diameter. This cake topper looks fabulous as a keepsake candle holder after the party is over.